MSD has completed the construction of a new concrete liner at the Bells Lane Wet Weather Treatment Facility. Designed to help reduce odors at the facility, the liner allows a wash-down or cleaning after each use of the basin. Click here for more information. MSD’s Central Relief Drain Overflow Mitigation Project is complete. The Central Relief drain is a stormwater pipe that flows from the center of the city beginning south of Broadway to the Ohio River. Before this project was complete, there were places along the pipe where a combination of wastewater and rainwater entered the pipe and flowed into the Ohio River. 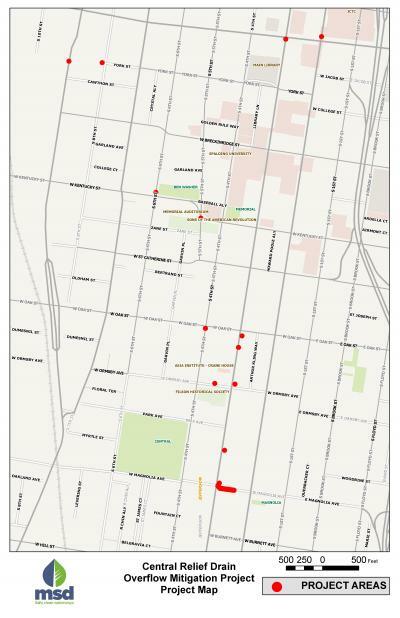 The Central Relief Drain Overflow Mitigation Project reduces the frequency and volume of these combined sewer overflows. In one area, the work routes combined sewer flow into a portion of the combined sewer system that has more capacity and can handle the increased flow. MSD also adjusted diversion dam elevations to optimize flow through the combined sewer system. On August 4, 2009, West Louisville experienced widespread flash flooding, the worst of which was in the Maple Street area. To improve public health and safety, MSD pursued and was awarded a FEMA grant to assist residents and provide opportunities for those in the highest risk areas to relocate. An advisory committee has been formed to identify possible uses for the acquired flood-prone properties and to define ownership and long-term maintenance options for the accepted use. Learn more about the Maple Street Land Use Planning Project here. Underground storage basins and the tunnel are part of MSD's larger endeavor to prevent sewage overflows into our waterways. 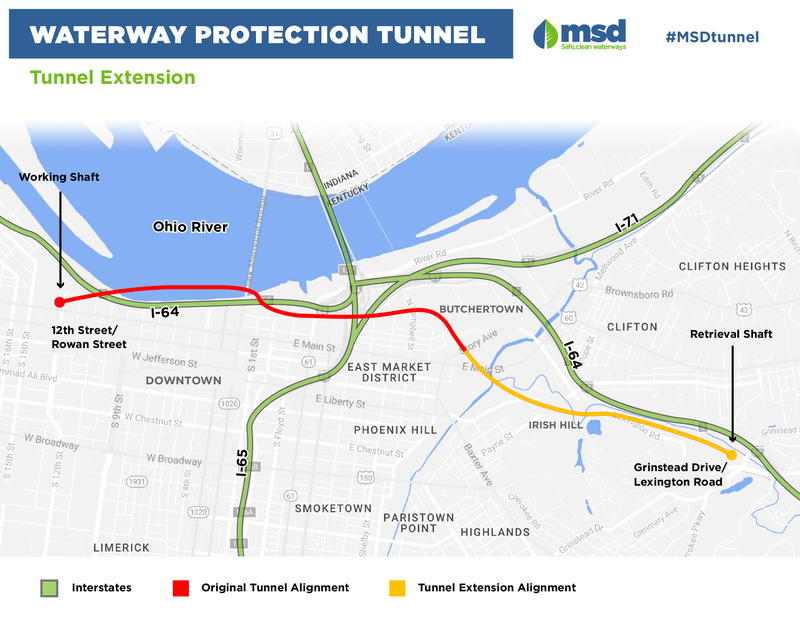 The basins and tunnel are designed to capture rainwater and sewage, which otherwise can overwhelm the sewer system during rain events and flow untreated into local streams and the Ohio River. These underground storage areas retain the mixture of rainwater and sewage until the rain subsides and capacity is available, and then gradually release it back into the sewer system. At that point, the water is conveyed to a water quality treatment center, treated and returned to our local streams or the Ohio River. The Clifton Heights Basin became substantially complete on December 21, with grading and landscaping planned for spring. The basin is mostly underground and covered, with a small building above that includes pumps and equipment for operation. This basin offers Beargrass Creek protection from combined sewer overflows. The Waterway Protection Tunnel replaces the planned storage basin project near Lexington and Grinstead. Additionally, when the underground tunnel project is complete, the above-ground site will gain a new public green space to serve as a trailhead for the Beargrass Creek Trail, complete with parking, paths, trails, a rain garden, and a wetland preservation area. Operational since December 20, 2017, the Logan Street Combined Sewer Overflow (CSO) Basin at 935 Logan Street now captures 11 combined sewer overflow points that used to discharge 15,400,000 gallons of a mixture of sewage and rainwater in a typical rainfall year into the South Fork of Beargrass Creek. The basin is a concrete underground structure with a storage capacity of 16.7 million gallons. It has an above ground operations building and an access ramp to allow service vehicles to enter for periodic maintenance. There are 10,000 feet of 24- to 96-inch sewer pipes that collect flow from 11 overflow points and convey it to the basin. The sewer water is stored in the basin until capacity is available in the sewer system. At that time, the water is conveyed to Morris Forman Water Quality Treatment Center, treated and released into the Ohio River. MSD transferred the site to the Louisville Metro Housing Authority to better accommodate public use and maintenance of the site. The Housing Authority is partnering with the local community to develop and implement a plan for public use of the property. MSD retains an easement to allow maintenance of the basin. The Waterway Protection Tunnel takes the place of four proposed basin projects—Lexington Road and Payne Street; Story Avenue and Main Street; Lexington Road and Grinstead Drive; and 13th and Rowan streets. The construction of this deep-rock tunnel will be less disruptive—than the construction of the four basins and their conveyance lines—for the downtown business district, Butchertown business district and for traffic in the affected neighborhoods during the two-year construction period. Additionally, the Waterway Protection Tunnel offers more storage capacity than the four proposed basins for about the same cost. The 6.7-million-gallon basin will capture overflow from a location at 34th Street that currently overflows into the Ohio River when it rains. Once construction is complete in November 2019, there will be numerous improvements left in its wake. Among those will be a new roadway into Lannan Memorial Park, with a curved road replacing the straight roadway, to help reduce traffic speeds. The roadway was relocated to allow a working area along the perimeter of the basin. A new sidewalk adjacent to the roadway will extend from Northwestern Parkway into the park. A rain garden and a grass field will add to both the park’s beauty and its function. The Shawnee Park Basin (Southwestern Parkway Storage Basin) — a covered underground facility — is under construction in Shawnee Park, near the Southwestern Parkway entrance. This 20-million-gallon structure will be empty most of the time. When it rains, untreated wastewater and stormwater are captured by conveyance pipes and stored in the basin instead of flowing into the Ohio River. When the rain subsides, and system capacity is available, the mixture of wastewater and stormwater will be pumped back into the sewer system. At that point, the water is conveyed to a water quality treatment center, treated and returned to the Ohio River. When completed, the project will be largely invisible to the public and will enhance not only the water quality of the Ohio River, but also the quality of one of Louisville's premier parks. Learn more about this specific project at ShawneeParkBasinProject.org.